The earliest descriptions of limb-girdle weakness are ascribed to Leyden  and Möbius  in 1876 and 1879, respectively. They described adult patients with a pelvic and femoral distribution of weakness and atrophy with a benign course. In 1884, Erb characterized a juvenile form of proximal muscle weakness. Erb's patient had only shoulder-girdle weakness and atrophy, with sparing of other muscles of the body and a benign disease course compared with that described by Duchenne in the 1860s. Duchenne, a French physician, initially described a condition of progressive lethal wasting of degenerative skeletal muscle, which was later referred to as Duchenne muscular dystrophy. At that time, the differentiation between the spinal muscular atrophies and weakness associated with central nervous system disorders and primary muscle disease had not been established. Between 1909 and 1954, many individual case reports of primary muscle disease with a limb-girdle distribution of weakness were published. In 1954, when Walton and Nattrass reported 105 cases of limb-girdle weakness associated with many other disorders, the nosologic entity of limb-girdle dystrophy was formally established. Walton and Nattrass described the disease as a progressive muscle weakness with atrophy involving predominantly proximal muscles (eg, pelvis, shoulder). They described the disease as having a variable age of onset in the late first, second, third, fourth, or fifth decade of life; a slow clinical progression; and an autosomal recessive or autosomal dominant form of inheritance. See image below. Dystrophin-glycoprotein complex bridges the inner cytoskeleton (F-actin) and the basal lamina. 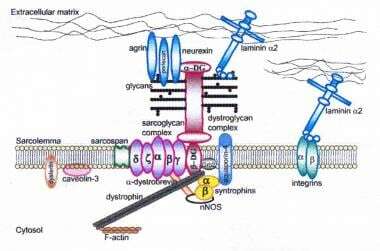 Mutations in all sarcoglycans, in dysferlin, and in caveolin-3, as well as mutations that cause abnormal glycosylation of alpha-dystroglycan, can result in limb-girdle muscular dystrophy. The development of sophisticated diagnostic tools of histology, histochemistry, ultrastructure, electrodiagnosis, and genetic studies has since shown that the entity, as originally described, is composed of a variety of neuromuscular disorders (eg, spinal muscular atrophy, polymyositis, endocrine disorders, metabolic conditions, congenital myopathies). Since the original descriptions of the condition, reports of many sporadic cases have been published with this pattern of muscle weakness associated with many other disorders. Thus, the concept of limb-girdle muscular dystrophy (LGMD) as a nosologic entity was challenged, and now it is fair to consider it a symptom complex that consists of at least 4 disorders with varied inheritance patterns and etiologies. Therefore, importantly, the clinical features, the inheritance pattern, and the exclusion of other entities should define the disorders of LGMD. 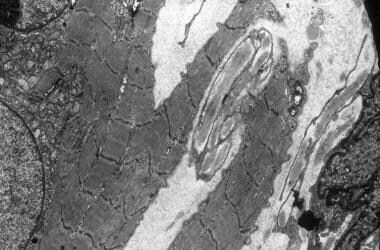 Electron micrograph showing streaming of band Z and splitting of the muscle fiber. A central nucleus is surrounded by a collection of small mitochondria. See the descriptions of each type of LGMD in the History section. Exact figures are not available. The frequency of limb-girdle muscular dystrophy in the general population cannot be estimated because of the heterogenous nature of this group of disorders (see Background). Limb-girdle muscular dystrophy is associated with low mortality and morbidity. No racial predilection is described for limb-girdle muscular dystrophy. Limb-girdle muscular dystrophy may show an autosomal recessive or sporadic method of inheritance. Leyden E. Klinik der Ruckenmarks-Krankheiten. Vol 2. Berlin:. Hirschwalk. 1876:531. Möbius PJ. Ueber die hereditaren nervenkrankheiten. Volkmanns Samml Klin Notiz. 1879. 171:1505. Erb W. Ueber die "Juvenile Form" der progressiven Muskelatrophie ihre Beziehungen zur sogenannten Pseudohypertrophie der Muskeln. Dtsh Archiv Klin Med. 1884. 34:467. Erb W. Dystrophia muscularis progressiva. Klinische und pathologisch anatomische Studien. Dtsch Nervenh. 1891. 1:13. Batten FE. The myopathies or muscular dystrophies. Q J Med. 1910. 3:313. Landouzy L, Dejerine J. De La myopathic atrophique - progressive (myopathic heriditaire debutant dansleufavec, Par la free saus alteration du systeme nerveux). Services Alad Sci. 1884. 53:98. Gower ER. A lecture on myopathy and a distal form. Br Med J. 1902. 2:89. Spiller WG. Myopathy of the distal type and its relation to the neuroforamin of muscular atrophy (Charcot Marie Tooth Type). J Neur Med Dis. 1907. 34-14. Walton JN, Nattrass FJ. On the classification, natural history and treatment of the myopathies. Brain. 1954. 77(2):169-231. [Medline]. Fanin M, Tasca E, Nascimbeni AC, et al. Sarcolemmal neuronal nitric oxide synthase defect in limb-girdle muscular dystrophy: an adverse modulating factor in the disease course?. J Neuropathol Exp Neurol. 2009 Mar 12. [Medline]. Garnham C, Hanna R, Chou J, Low K, Gourlay K, Campbell R, et al. Limb-girdle muscular dystrophy type 2A can result from accelerated autoproteolytic inactivation of calpain 3. Biochemistry. 2009 Feb 18. [Medline]. McMillan HJ, Carter MT, Jacob PJ, et al. Homozygous contiguous gene deletion of 13q12 causing LGMD2C and ARSACS in the same patient. Muscle Nerve. 2009 Mar. 39(3):396-9. [Medline]. Vuillaumier-Barrot S, Quijano-Roy S, Bouchet-Seraphin C, et al. Four Caucasian patients with mutations in the fukutin gene and variable clinical phenotype. Neuromuscul Disord. 2009 Mar. 19(3):182-8. [Medline]. Rosales XQ, Tsao CY. Childhood onset of limb-girdle muscular dystrophy. Pediatr Neurol. 2012 Jan. 46(1):13-23. [Medline]. Nigro V, Aurino S, Piluso G. Limb girdle muscular dystrophies: update on genetic diagnosis and therapeutic approaches. Curr Opin Neurol. 2011 Oct. 24(5):429-36. [Medline]. Hauser MA, Horrigan SK, Salmikangas P, et al. Myotilin is mutated in limb girdle muscular dystrophy 1A. Hum Mol Genet. 2000 Sep 1. 9(14):2141-7. [Medline]. [Full Text]. Hauser MA, Conde CB, Kowaljow V, et al. Myotilin mutation found in second pedigree with LGMD1A. Am J Hum Genet. 2002 Dec. 71(6):1428-32. [Medline]. [Full Text]. Salmikangas P, van der Ven PF, Lalowski M, et al. Myotilin, the limb-girdle muscular dystrophy 1A (LGMD1A) protein, cross-links actin filaments and controls sarcomere assembly. Hum Mol Genet. 2003 Jan 15. 12(2):189-203. [Medline]. [Full Text]. Muchir A, Bonne G, van der Kooi AJ, et al. Identification of mutations in the gene encoding lamins A/C in autosomal dominant limb girdle muscular dystrophy with atrioventricular conduction disturbances (LGMD1B). Hum Mol Genet. 2000 May 22. 9(9):1453-9. [Medline]. [Full Text]. Merlini L, Carbone I, Capanni C, Sabatelli P, Tortorelli S, Sotgia F, et al. Familial isolated hyperCKaemia associated with a new mutation in the caveolin-3 (CAV-3) gene. J Neurol Neurosurg Psychiatry. 2002 Jul. 73(1):65-7. [Medline]. [Full Text]. Messina DN, Speer MC, Pericak-Vance MA, McNally EM. Linkage of familial dilated cardiomyopathy with conduction defect and muscular dystrophy to chromosome 6q23. Am J Hum Genet. 1997 Oct. 61(4):909-17. [Medline]. [Full Text]. Speer MC, Vance JM, Grubber JM, Lennon Graham F, Stajich JM, Viles KD, et al. Identification of a new autosomal dominant limb-girdle muscular dystrophy locus on chromosome 7. Am J Hum Genet. 1999 Feb. 64(2):556-62. [Medline]. [Full Text]. Mascarenhas DA, Spodick DH, Chad DA, et al. Cardiomyopathy of limb-girdle muscular dystrophy. J Am Coll Cardiol. 1994 Nov 1. 24(5):1328-33. [Medline]. Gigliotti F, Pizzi A, Duranti R, Gorini M, Iandelli I, Scano G. Control of breathing in patients with limb girdle dystrophy: a controlled study. Thorax. 1995 Sep. 50(9):962-8. [Medline]. [Full Text]. Guyon JR, Kudryashova E, Potts A, et al. Calpain 3 cleaves filamin C and regulates its ability to interact with gamma- and delta-sarcoglycans. Muscle Nerve. 2003 Oct. 28(4):472-83. [Medline]. Richard I, Broux O, Allamand V, et al. Mutations in the proteolytic enzyme calpain 3 cause limb-girdle muscular dystrophy type 2A. Cell. 1995 Apr 7. 81(1):27-40. [Medline]. Bansal D, Miyake K, Vogel SS, et al. Defective membrane repair in dysferlin-deficient muscular dystrophy. Nature. 2003 May 8. 423(6936):168-72. [Medline]. Liu J, Aoki M, Illa I, et al. Dysferlin, a novel skeletal muscle gene, is mutated in Miyoshi myopathy and limb girdle muscular dystrophy. Nat Genet. 1998 Sep. 20(1):31-6. [Medline]. Matsuda C, Hayashi YK, Ogawa M, et al. The sarcolemmal proteins dysferlin and caveolin-3 interact in skeletal muscle. Hum Mol Genet. 2001 Aug 15. 10(17):1761-6. [Medline]. [Full Text]. Rosales XQ, Moser SJ, Tran T, McCarthy B, Dunn N, Habib P, et al. Cardiovascular magnetic resonance of cardiomyopathy in limb girdle muscular dystrophy 2B and 2I. J Cardiovasc Magn Reson. 2011 Aug 4. 13:39. [Medline]. [Full Text]. Nigro V, de Sá Moreira E, Piluso G, et al. Autosomal recessive limb-girdle muscular dystrophy, LGMD2F, is caused by a mutation in the delta-sarcoglycan gene. Nat Genet. 1996 Oct. 14(2):195-8. [Medline]. Noguchi S, McNally EM, Ben Othmane K, et al. Mutations in the dystrophin-associated protein gamma-sarcoglycan in chromosome 13 muscular dystrophy. Science. 1995 Nov 3. 270(5237):819-22. [Medline]. Roberds SL, Leturcq F, Allamand V, et al. Missense mutations in the adhalin gene linked to autosomal recessive muscular dystrophy. Cell. 1994 Aug 26. 78(4):625-33. [Medline]. Moreira ES, Wiltshire TJ, Faulkner G, et al. Limb-girdle muscular dystrophy type 2G is caused by mutations in the gene encoding the sarcomeric protein telethonin. Nat Genet. 2000 Feb. 24(2):163-6. [Medline]. Frosk P, Weiler T, Nylen E, Sudha T, Greenberg CR, Morgan K, et al. Limb-girdle muscular dystrophy type 2H associated with mutation in TRIM32, a putative E3-ubiquitin-ligase gene. Am J Hum Genet. 2002 Mar. 70(3):663-72. [Medline]. [Full Text]. Brockington M, Yuva Y, Prandini P, et al. Mutations in the fukutin-related protein gene (FKRP) identify limb girdle muscular dystrophy 2I as a milder allelic variant of congenital muscular dystrophy MDC1C. Hum Mol Genet. 2001 Dec 1. 10(25):2851-9. [Medline]. Krag TO, Hauerslev S, Sveen ML, Schwartz M, Vissing J. Level of muscle regeneration in limb-girdle muscular dystrophy type 2I relates to genotype and clinical severity. Skelet Muscle. 2011 Oct 5. 1(1):31. [Medline]. [Full Text]. Hackman P, Vihola A, Haravuori H, Marchand S, Sarparanta J, De Seze J, et al. Tibial muscular dystrophy is a titinopathy caused by mutations in TTN, the gene encoding the giant skeletal-muscle protein titin. Am J Hum Genet. 2002 Sep. 71(3):492-500. [Medline]. [Full Text]. Schneiderman LJ, Sampson WI, Schoene WC, et al. Genetic studies of a family with two unusual autosomal dominant conditions: muscular dystrophy and Pelger-Huet anomaly. Clinical, pathologic and linkage considerations. Am J Med. 1969 Mar. 46(3):380-93. [Medline]. Bacon PA, Smith B. Familial muscular dystrophy of late onset. J Neurol Neurosurg Psychiatry. 1971 Feb. 34(1):93-7. [Medline]. [Full Text]. De Coster W, De Reuck J, Thiery E. A late autosomal dominant form of limb-girdle muscular dystrophy. A clinical, genetic, and morphological study. Eur Neurol. 1974. 12(3):159-72. [Medline]. SHY GM, McEACHERN D. The clinical features and response to cortisone of menopausal muscular dystrophy. J Neurol Neurosurg Psychiatry. 1951 May. 14(2):101-7. [Medline]. [Full Text]. Denny-Brown D. Myopathic weakness of quadriceps. Proc R Soc Med. 1939. 32:867.
van Wijngaarden GK, Hagen CJ, Bethlem J, Meijer AE. Myopathy of the quadriceps muscles. J Neurol Sci. 1968 Sep-Oct. 7(2):201-6. [Medline]. Espir ML, Matthews WB. Hereditary quadriceps myopathy. J Neurol Neurosurg Psychiatry. 1973 Dec. 36(6):1041-5. [Medline]. [Full Text]. Narayanaswami P, Weiss M, Selcen D, et al. Evidence-based guideline summary: diagnosis and treatment of limb-girdle and distal dystrophies: report of the guideline development subcommittee of the American Academy of Neurology and the practice issues review panel of the American Association of Neuromuscular & Electrodiagnostic Medicine. Neurology. 2014 Oct 14. 83 (16):1453-63. [Medline]. [Full Text]. Cossée M, Lagier-Tourenne C, Seguela C, et al. Use of SNP array analysis to identify a novel TRIM32 mutation in limb-girdle muscular dystrophy type 2H. Neuromuscul Disord. 2009 Mar 18. [Medline]. Fanin M, Nascimbeni AC, Angelini C. Gender difference in limb-girdle muscular dystrophy: a muscle fiber morphometric study in 101 patients. Clin Neuropathol. 2014 May-Jun. 33(3):179-85. [Medline]. Siciliano G, Simoncini C, Giannotti S, Zampa V, Angelini C, Ricci G. Muscle exercise in limb girdle muscular dystrophies: pitfall and advantages. Acta Myol. 2015 May. 34 (1):3-8. [Medline]. [Full Text]. Jensen BR, Berthelsen MP, Husu E, Christensen SB, Prahm KP, Vissing J. Body weight-supported training in Becker and limb girdle 2I muscular dystrophy. Muscle Nerve. 2016 Jan 16. [Medline]. Yeldan I, Gurses HN, Yuksel H. Comparison study of chest physiotherapy home training programmes on respiratory functions in patients with muscular dystrophy. Clin Rehabil. 2008 Aug. 22(8):741-8. [Medline]. Bohan A, Peter JB. Polymyositis and dermatomyositis (first of two parts). N Engl J Med. 1975 Feb 13. 292(7):344-7. [Medline]. Bohan A, Peter JB. Polymyositis and dermatomyositis (second of two parts). N Engl J Med. 1975 Feb 20. 292(8):403-7. [Medline]. Boulogne D. Recherches sur la paralysie, musculaire psudohypertrophyic, on Paralysé myosclerozyic. Selections translated in Brody IA, ed. Neurologic Classic 1973. Arch Gen Med. 1868. 11:5, 179, 305, 421, 552. Bramwell E. Observations on myopathy. Proc R Soc Med. 1922. 16:1. Hematoxylin and eosin stain. Note the variation in fiber size. Necrotic fiber is shown with many nuclei (magnification 250X). Marked endomysial fibrosis with atrophic and hypertrophic fibers. Hematoxylin and eosin stain. Note the splitting of the fiber. Gomori trichrome stain. Note the variation in fiber size and subsarcolemmal vacuoles, central nuclei, and subsarcolemmal collection of trichrome-positive material. Light type I and dark type IIA fibers. Electron micrograph showing abnormal mitochondria, a large lysosomal body, and a central nucleus. Trichrome stain. Note variation in fiber size. Necrotic fiber giant fibers and cytoplasmic inclusions. The authors and editors of Medscape Reference wish to thank Suneet Sahgal, MD, Staff Physician, Department of Physical Medicine and Rehabilitation, Northwestern University Medical School, for his previous contribution to this article.